Fomin A. N., Samarin V. I., Kryukov S. A. 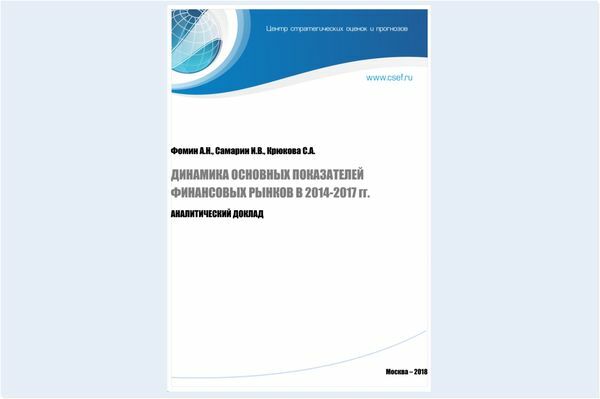 "Dynamics of the major indicators of financial markets in 2014-2017 Analytical report"
Developed at the Center for strategic estimates and projections of the information-analytical system "the Indicator" is designed to provide early warning of the global financial and economic crisis. It is based on a comparative analysis of the dynamics of indicators of the main segments of the financial market: stock, currency, oil markets, structural and precious metals. Currently, the system Gauge operates 50 private indicators, which values each trading day starts in database system. Based on them next is the formation of generalized indicators of individual segments and the global financial market as a whole. Preemptively answer the natural questions: why do we need to develop a new global indicators? Why can't you existing? The answer is simple: a well-known global indicators "missed" the crisis of 2008-09 and, in addition, they are not focused on the Russian economy. Therefore, without denying the existing global indicators, we have tried to create an additional tool of analysis that, in our opinion, can afford to strengthen forecasting capabilities in strategic planning anti-crisis measures in Russia. The list of indicators presented in table.1. Note that the US stock market presented not one but five stock indices. And apply one of the stock index. While RF is used for ruble and dollar stock index RTSI. In the future it is planned to expand this list, primarily due to the inclusion in the nomenclature of indicators of product market of basic foodstuffs and expanding the list of currencies. Since the dominant part of the world's assets are denominated in U.S. dollars, then all the private indicators are presented in us dollar terms, which ensures the universality of the results.